As we have discussed for the previous quarters, the small state of Rhode Island mustered a total of four artillery regiments for the Federal cause. FOUR! Battery A: “In the field” with six 3-inch Ordnance Rifles. Captain William A. Arnold remained in command of this battery, supporting Second Corps. Their “in the field” location at the end of September was Culpeper County, Virginia. Battery B: Also “In the field,” but with six 12-pdr Napoleons. Battery B also served in Second Corps’ artillery brigade, and thus was also in Culpeper at this time. Captain John G. Hazard of this battery was the corps artillery chief. In his place, Lieutenant William S. Perrin commanded. Battery C: Reporting at Warrenton, Virgnia, with six 10-pdr Parrotts. Captain Richard Waterman commanded this battery supporting the Sixth Corps. Battery E: Reporting at Culpeper, Virginia with six 12-pdr Napoleons. The battery remained with Third Corps. Captain George E. Randolph, of this battery, was in command of the corps’ artillery brigade. Lieutenant John K. Bucklyn commanded the battery in his place. Battery F: At Newport News, Virginia with six 12-pdr Napoleons (vice 10-pdr Parrotts reported in the last quarter). Captain James Belger commanded this battery, though he was at the time on extended leave recovering from a wound and on recruiting duty. In his place Lieutenant Thomas Simpson commanded. The battery spent the summer assigned to the Defenses of New Berne, North Carolina. And they supported several reconnaissance operations during those months. In October the battery was ordered to NewPort News. Battery G: Reporting at Warrenton with six 3-inch Ordnance Rifles. Captain George W. Adams remained in command. And the battery remained assigned to the Sixth Corps. Battery H: At Fort Scott, Virginia with six 3-inch Ordnance Rifles. Assigned to the Twenty-second Corps from the Defenses of Washington. Captain Jeffrey Hazard resigned in August. Lieutenant Charles F. Mason stood in as commander in his absence. Lieutenant Crawford Allen, Jr. would transfer from Battery G in December, and receive the captaincy. Rhode Island would not form any other batteries within the 1st Artillery Regiment. Battery C: Reporting on Morris Island, South Carolina with two 12-pdr field howitzers and four 3-inch Ordnance Rifles. Captain Charles R. Brayton remained in command. We’ll cover the remainder of this regiment in a latter post focused on heavy artillery. Battery B, 1st RI: 192 shot, 64 shell, 192 case, and 64 canister for 12-pdr Napoleons. Battery E, 1st RI: 288 shot, 96 shell, 284 case, and 96 canister for 12-pdr Napoleons. Battery F, 1st RI: 400 shot, 160 shell, 360 case, and 144 canister for 12-pdr Napoleons. Battery C, 3rd RI: 120 shell, 214 case, and 92 canister for 12-pdr field howitzers. Battery A, 1st RI: 175 canister, 57 percussion shell, 533 fuse shell, and 509 bullet shell for 3-inch rifles. Battery G, 1st RI: 199 canister, 124 percussion shell, 149 fuse shell, and 334 bullet shell for 3-inch rifles. Battery H, 1st RI: 120 canister and 231 percussion shell for 3-inch rifles. Battery C: 3rd RI: 180 canister, 84 percussion shell, 468 fuse shell, and 539 bullet shell for 3-inch rifles. Battery G, 1st RI: 34 shell for 3-inch rifles. Battery C, 1st RI: 491 shell, 367 case, and 122 canister for 10-pdr Parrott. Battery A, 1st RI: 64 shell for 3-inch rifles. 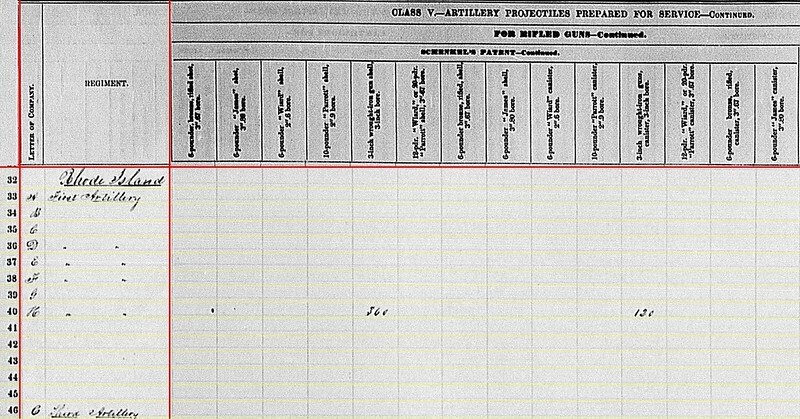 Battery G, 1st RI: 146 shell and 33 case for 3-inch rifles. 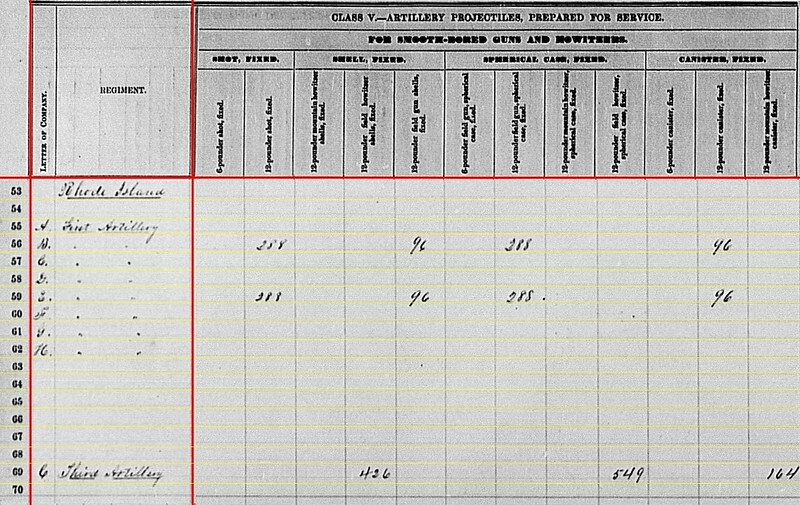 Battery H, 1st RI: 260 shell and 589 case for 3-inch rifles. 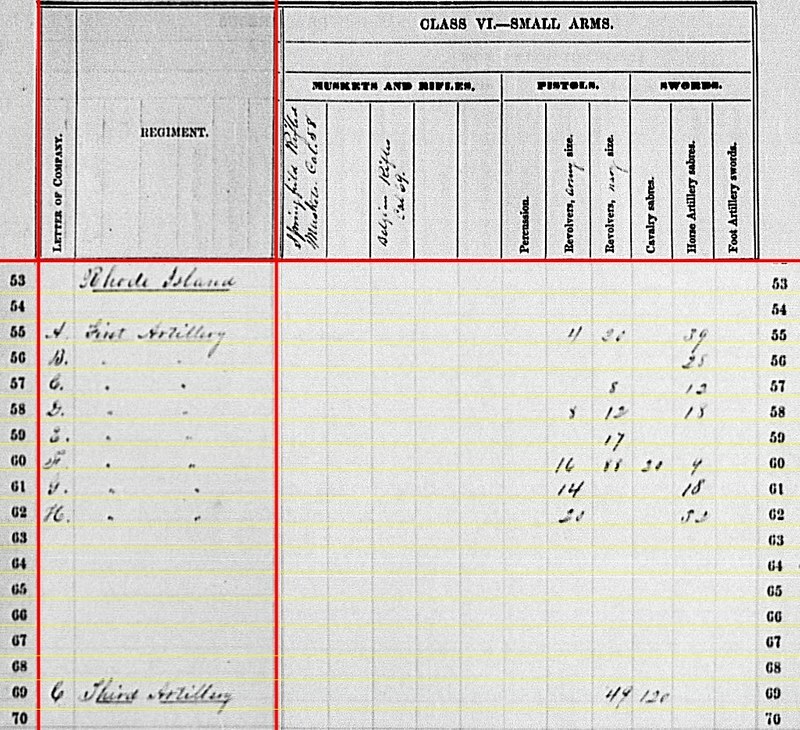 Battery C, 3rd RI: 104 shell and 173 case for 3-inch rifles. Battery A, 1st RI: Four army revolvers, nineteen navy revolvers and thirty horse artillery sabers. Battery B, 1st RI: Twenty horse artillery sabers. Battery C, 1st RI: Seven navy revolvers and twelve horse artillery sabers. Battery D, 1st RI: Eight army revolvers, twelve navy revolvers, forty-five cavalry sabers, and five horse artillery sabers. Battery E, 1st RI: Twelve navy revolvers and one horse artillery saber. Battery F, 1st RI: 102 army revolvers and twenty horse cavalry sabers. Battery G, 1st RI: Eight navy revolvers, ten cavalry sabers, and seventeen horse artillery sabers. Battery H, 1st RI: Twenty army revolvers and thirty-six horse artillery sabers. Battery C, 3rd RI: Forty-eight army revolvers, fifty-three cavalry sabers, and seventy-nine horse artillery sabers. The Rhode Island batteries leave us with few questions. The only question I pose what ammunition Battery D had on hand for its Napoleons? 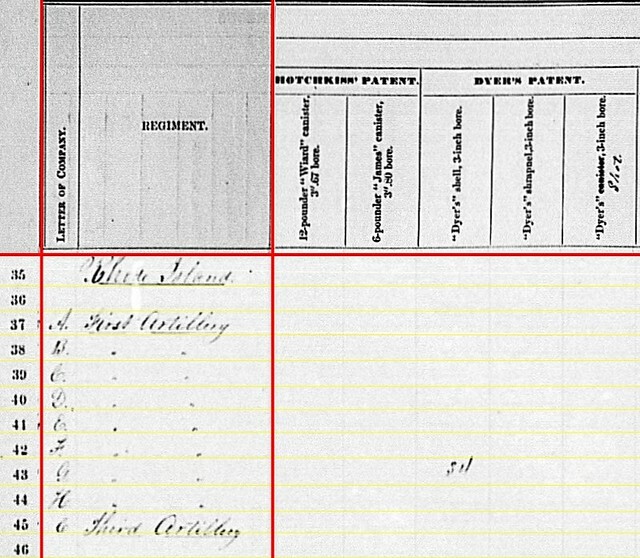 Perhaps this nearly complete accounting from the Rhode Island batteries reflects the number of its officers then serving as artillery chiefs. 1st Independent Battery: In Culpeper, Virginia with six 3-inch Ordnance Rifles. Captain Andrew Cowan remained in command of the battery, assigned to Sixth Corps, Army of the Potomac. 2nd Independent Battery: No return. The battery mustered out, in New York, on June 13, 1863. The men with time left on their enlistments transferred to Battery I, 1st New York. Captain Wolfgang Bock had authority to recruit a reorganized 2nd Independent Battery. On October 14, that authority was revoked and men recruited into the new 2nd were instead was made part of the 15th New York Heavy Artillery. 3rd Independent Battery: Also in Culpeper, Virginia but with six 10-pdr Parrotts. The battery was part of Sixth Corps, under Lieutenant William A. Harn. 4th Independent Battery: No return. Recall Captain James E. Smith’s battery lost three 10-pdr Parrotts on July 2 at Gettysburg (and one of those was on a disabled carriage). During that battle, the 4th was assigned to Third Corps. 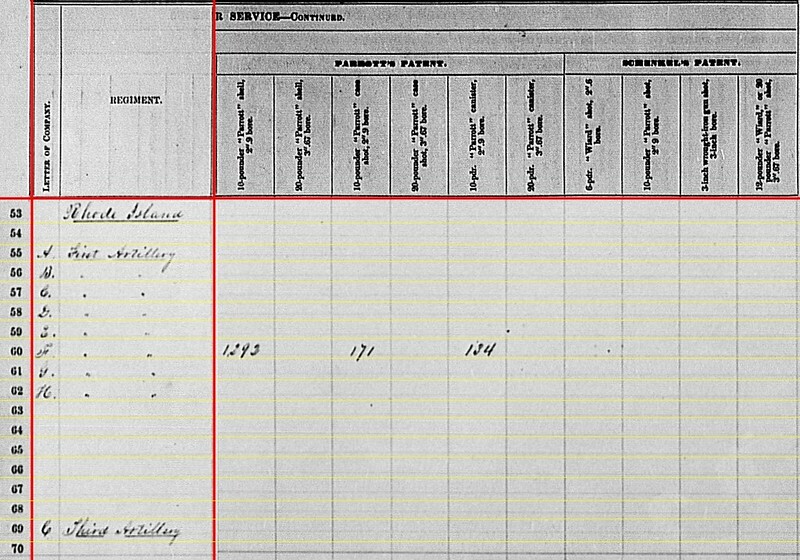 But on July 31st, the battery shows up on the returns for the Department of Washington, assigned to the Artillery Camp of Instruction, Camp Barry. 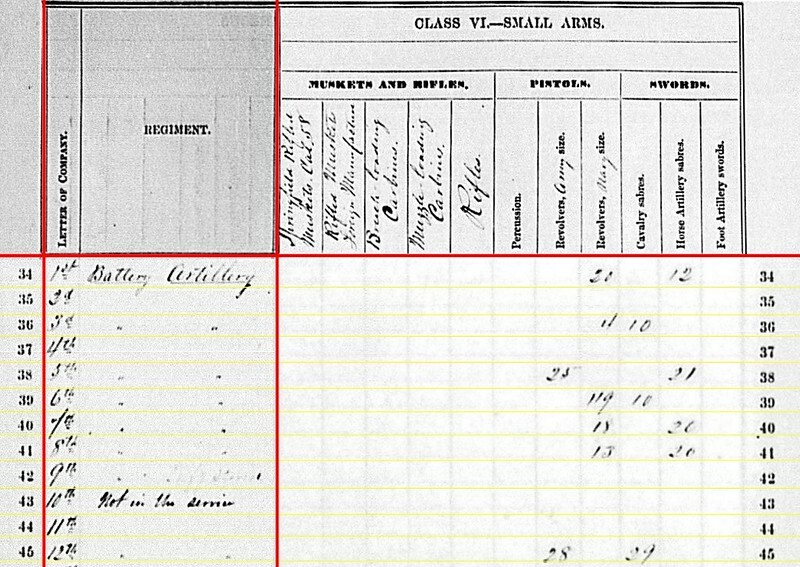 Smith’s battery returned to the Army of the Potomac in August, assigned to First Volunteer Brigade, Artillery Reserve. And on a monthly report dated August 31, the battery had six 12-pdr Napoleons. Smith took leave around that time. Lieutenant Thomas Goodman, and later Lieutenant William T. McLean, held command of the battery in Smith’s absence. 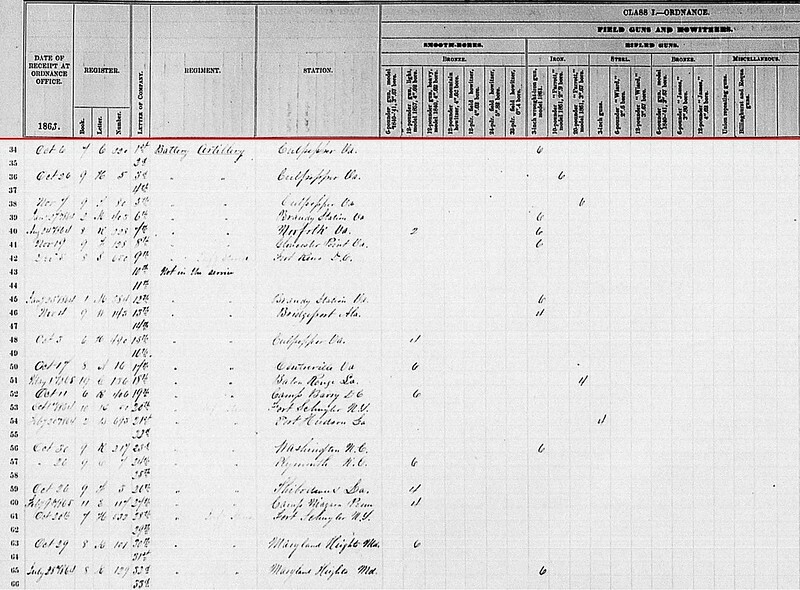 And, of course, with the assignment to the Reserve Artillery the battery was in Culpeper at the end of September. 5th Independent Battery: And another battery reporting from Culpeper. with six 20-pdr Parrotts. Captain Elijah D. Taft remained in command of this battery, in the Second Volunteer Brigade, Artillery Reserve. 6th Independent Battery: For a slight change, reporting at Brandy Station, Virginia, and with six 3-inch Ordnance Rifles. Captain Joseph W. Martin held command of this battery, assigned to the First Brigade, Horse Artillery, Army of the Potomac. And Martin, having fought hard at Fleetwood Hill earlier in June, certainly knew Brandy Station quite well! 7th Independent Battery: At Norfolk, Virginia with two 12-pdr Napoleons (down from three) and six 3-inch Ordnance Rifles. Captain Peter C. Regan’s battery supported the Seventh Corps. 8th Independent Battery: At Gloucester Point, Virginia with six 3-inch Ordnance Rifles. Captain Butler Fitch commanded this battery. In the previous quarter, the battery reported specific assignment to Fort Keyes in the defenses of Gloucester Point. 9th Independent Battery: Fort Reno, District of Columbia, with only infantry stores. Captain Emil Schubert remained in command. Battery assigned to the Twenty-Second Corps, defending Washington. Originally Company F, 41st New York Infantry, it was equipped as artillery and formally redesignated as an independent battery in December 1861. As indicated, the battery was not equipped as light artillery. 10th Independent Battery: Marked “not in service.” In the previous quarter, we discussed how this battery was broken up in June, with men mustering out or transferred to other batteries: 1st New Hampshire Battery; Battery E, 1st Massachusetts; and Batteries C and G, 1st Rhode Island. 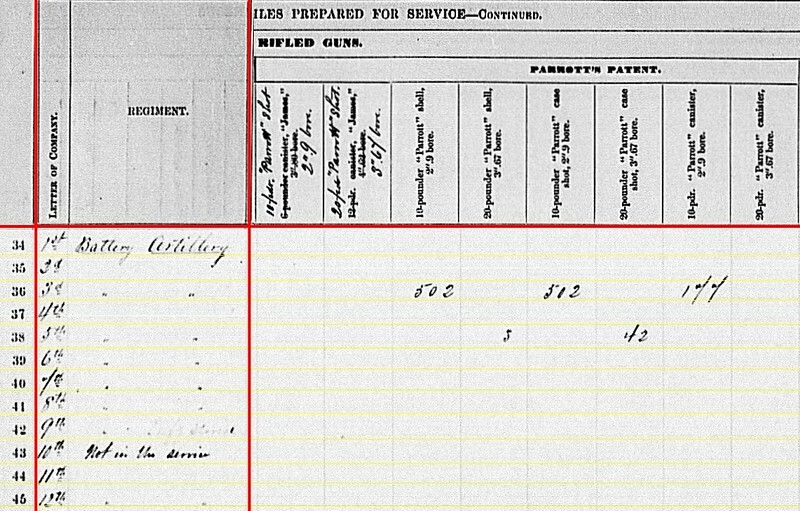 A detachment remained, udner Lieutenant Charles T. Bruen, and served in the Washington Defenses through June of 1864. 11th Independent Battery: No return. On, or about June 16, what remained of the battery was attached to Battery K, 1st New York Light. Captain John E. Burton was busy bringing this battery back up to strength (which he would not complete until the end of the year). 12th Independent Battery: At Brandy Station, Virginia reporting six 3-inch Ordnance Rifles. This battery transferred to Third Corps, being among the troops Major General William French brought over. Captain George F. McKnight remained in command. Very clean, from an administrative standpoint. 5th Battery: 91 canister for 6-pdr. 7th Battery: 41 shot, 46 shell, 89 case, and 65 canister for 12-pdr Napoleon. The bore diameter for 20-pdr Parrotts was 3.67-inches. The bore diameter for 6-pdr field guns was also 3.67-inches. Apparently we are seeing, in a pinch, that Taft’s battery received smoothbore ammunition when supplies of proper Parrott canister ran low. At least that’s the inference the data leads us to. 1st Battery: 120 canister, 7 percussion shell, 3 fuse shell, and 435 bullet shell for 3-inch rifles. 6th Battery: 93 canister, 10 fuse shell, and 128 bullet shell for 3-inch rifles. 7th Battery: 147 canister, 60 percussion shell, 228 fuse shell, and 619 bullet shell for 3-inch rifles. 8th Battery: 175 canister and 70 bullet shell for 3-inch rifles. 12th Battery: 60 canister, 65 percussion shell, 126 fuse shell, and 116 bullet shell for 3-inch rifles. 8th Battery: 321 shell and 650(?) shrapnel for 3-inch rifles. 3rd Battery: 502 shell, 502 case, and 177 canister for 10-pdr Parrott. 5th Battery: 3 shell and 42 case for 20-pdr Parrott. Yes, no Parrott canister for the 5th Battery. 1st Battery: 217 shell and 420 case for 3-inch rifles. 3rd Battery: 67 shell for 10-pdr Parrott. 5th Battery: 216 shell and 248 case for 20-pdr Parrott. 6th Battery: 654 shell and 4 case for 3-inch rifles. 8th Battery: 353 shell for 3-inch rifles. 12th Battery: 250 case for 3-inch rifles. 1st Battery: Twenty Navy revolvers and twelve horse artillery sabers. 3rd Battery: Four Navy revolvers and ten cavalry sabers. 5th Battery: Twenty-five Army revolvers and twenty-one horse artillery sabers. 6th Battery: 119 Navy revolvers and ten cavalry sabers. 7th Battery: Eighteen Navy revolvers and twenty horse artillery sabers. 8th Battery: Thirteen Navy revolvers and twenty horse artillery sabers. 12th Battery: Twenty-eight Army revolvers and twenty-nine cavalry sabers. That’s the first dozen of these New York Independent Batteries. Next up is the middle set. By way of refresher, Rhode Island provided four artillery regiments to the Federal ranks – one light regiment and three heavy regiments – along with two separate batteries (each of which only served three months early in the war). Contradicting the normal progression, two of the Rhode Island heavy regiments evolved from infantry regiments. The third was a USCT regiment. We’ll consider the lone Battery C, 3rd Rhode Island Heavy, which served as a field battery and is seen on this listing, in a separate post. Colonel Charles H. Tompkins commanded the regiment, though his primary duty was that of Artillery Chief of the Sixth Corps. 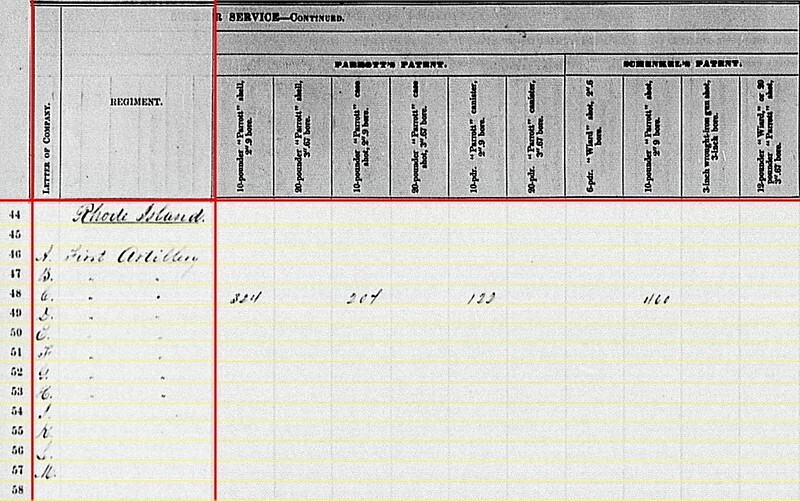 The 1st Rhode Island only ever mustered batteries A through H. The inclusion of the others (I, K, L, and M) for this quarter of 1863 was apparently clerical efficiency…. or deficiency, if you prefer. 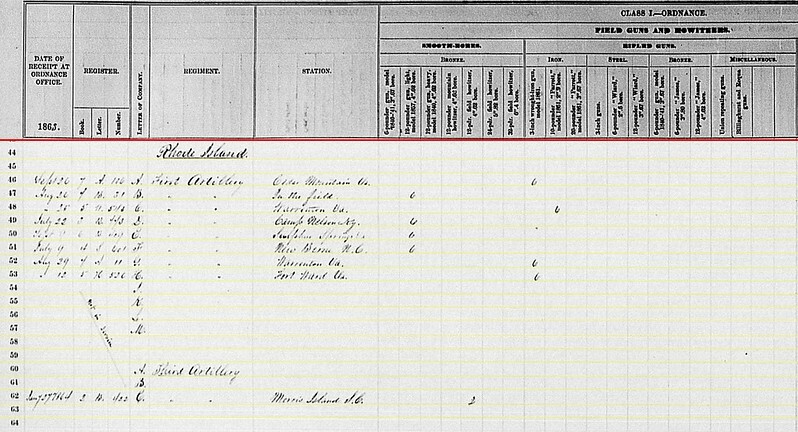 We find all eight batteries provided returns between July and September of 1863. Give those men a gold “B” for bureaucratic efficiency! 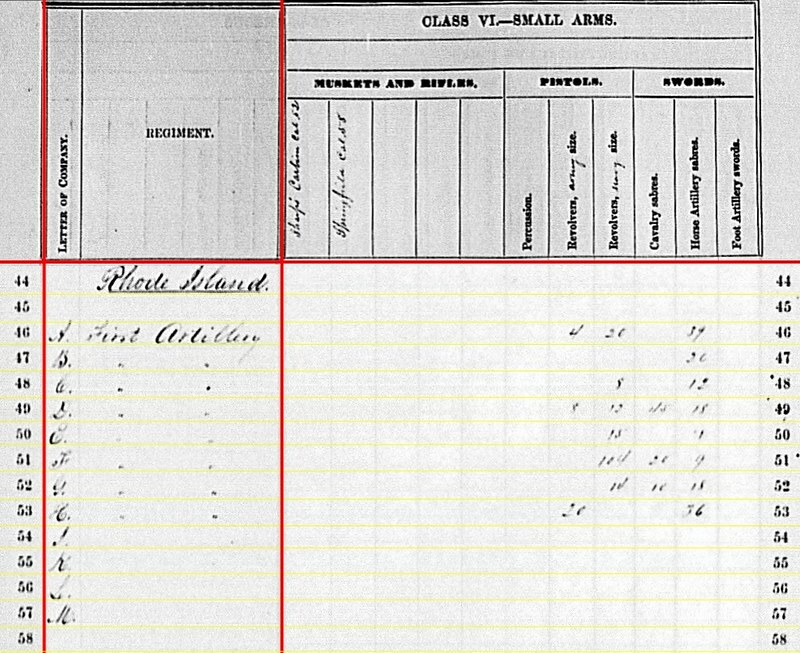 Battery A: Reporting at Cedar Mountain, Virginia, as of September 26, with six 3-inch Ordnance Rifles. Captain William A. Arnold remained in commanded this battery, supporting Second Corps. Thus the location as of June 30 was outside Taneytown, Maryland. The battery occupied a key position on Cemetery Ridge, July 2 and 3. Battery B: “In the field” with six 12-pdr Napoleons. Battery B paired with Battery A (above) in Second Corps’ artillery brigade. Thus their location at the end of June was also Taneytown. Captain John G. Hazard of this battery was the corps artillery chief. In his place, Lieutenant Thomas Frederick Brown commanded. In the afternoon of July 2, the battery helped repulse the Confederate attack on the center of the Federal lines. In that action the battery sustained heavy casualties, including Brown who was wounded. Lieutenant William S. Perrin, of the second section, assumed command. The battery briefly lost two guns in the fighting. Those recovered, the battery still had to send two guns to the rear for lack of men and horses. Lieutenant Joseph S. Milne, of this battery, served with Battery A, 4th US (Cushing’s). He was mortally wounded on July 3. 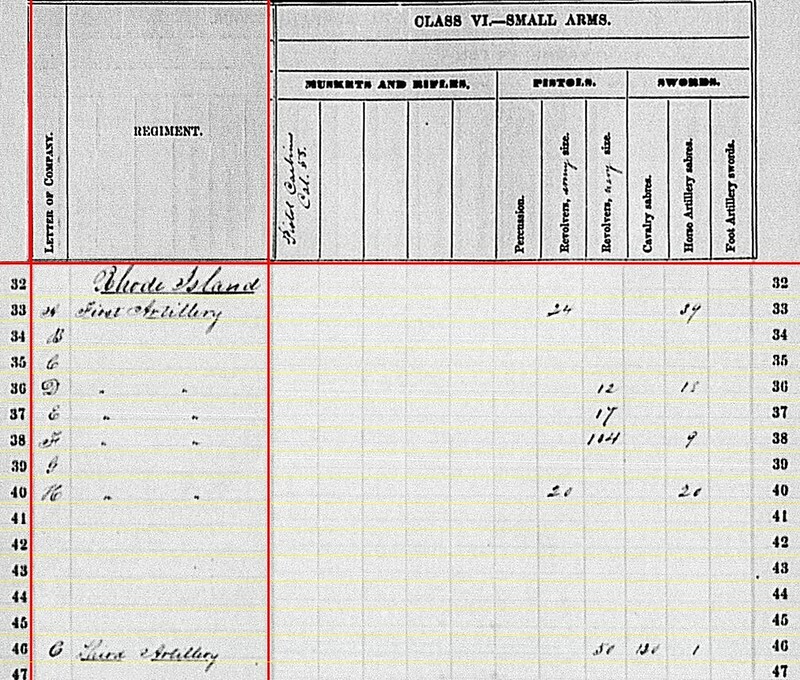 Battery C: Reporting, as of August 26, at Warrenton, Virgnia, with six 10-pdr Parrotts (as opposed to six 3-inch Ordnance Rifles on the previous return). Captain Richard Waterman commanded this battery, which had moved around a bit, organizationally speaking, in May and June. The battery fought at Chancellorsville in the Fifth Corps. An amendment to Special Orders No. 129 (May 12) sent the battery to the Third Volunteer Brigade, Artillery Reserve (which Waterman commanded, briefly). But just prior to the Gettysburg Campaign, the battery transferred to Sixth Corps (a temporary move made permanent on June 15). Thus we place them near Manchester, Maryland, as of June 30. The battery saw very little action at Gettysburg, being held in reserve for the most part. Sometime during the month that followed, the battery exchanged Ordnance rifles for Parrotts. Battery D: At Camp Nelson, Kentucky with six 12-pdr Napoleons. Captain William W. Buckley commanded this battery. With reorganizations within the Department of the Ohio, the battery moved from Second Division, Ninth Corps to First Division, Twenty-third Corps. Battery E: Reporting on September 9 at Sulphur Springs, Virginia with six 12-pdr Napoleons. The battery remained with Third Corps. Captain George E. Randolph, of this battery, was in command of the corps’ artillery brigade. Lieutenant Pardon S. Jastram, formerly commanding the battery, accepted a position as Randolph’s adjutant. Thus Lieutenant John K. Bucklyn commanded the battery at the start of the Gettysburg Campaign. Marching with the Third Corps, the battery was at Emmitsburg on the evening of June 30. In the afternoon of July 2, Battery E occupied a position on the Emmitsburg Pike near the Sherfy Farm. There the battery faced Barksdale’s attack and was driven back with Graham’s Brigade. With Bucklyn wounded, command devolved to Lieutenant Benjamin Freeborn. Despite the desperate position, the battery managed to secure all its guns, losing only a caisson (which was recaptured after the battle). Losses were five killed, and 24 wounded. The battery lost forty horses, however. Battery F: At New Berne, North Carolina with six 12-pdr Napoleons (vice 10-pdr Parrotts reported in the last quarter). Captain James Belger commanded this battery, part of the Artillery Brigade, Eighteenth Corps. The battery sent sections in support of several operations during the spring and early summer. Battery G: Reporting on August 29 at Warrenton with six 3-inch Ordnance Rifles. 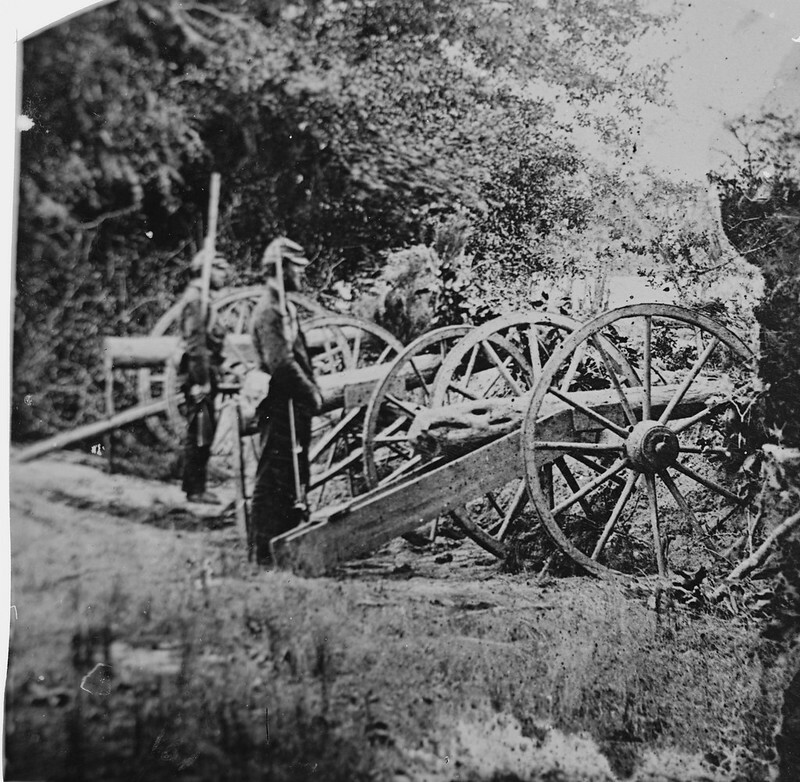 Captain George W. Adams’ battery was another that moved around during the spring. After Chancellorsville, the battery moved from Second Corps to the Fourth Brigade, Artillery Reserve. Then in June the battery was transferred to Colonel Tompkins’ brigade to support Sixth Corps. The battery camped at Manchester, Maryland on the night of June 30. The battery remained in reserve through the battle of Gettysburg. Battery H: At Fort Ward, Virginia with six 3-inch Ordnance Rifles. Assigned to the Twenty-second Corps from the Defenses of Washington. Captain Jeffrey Hazard commanded this battery. 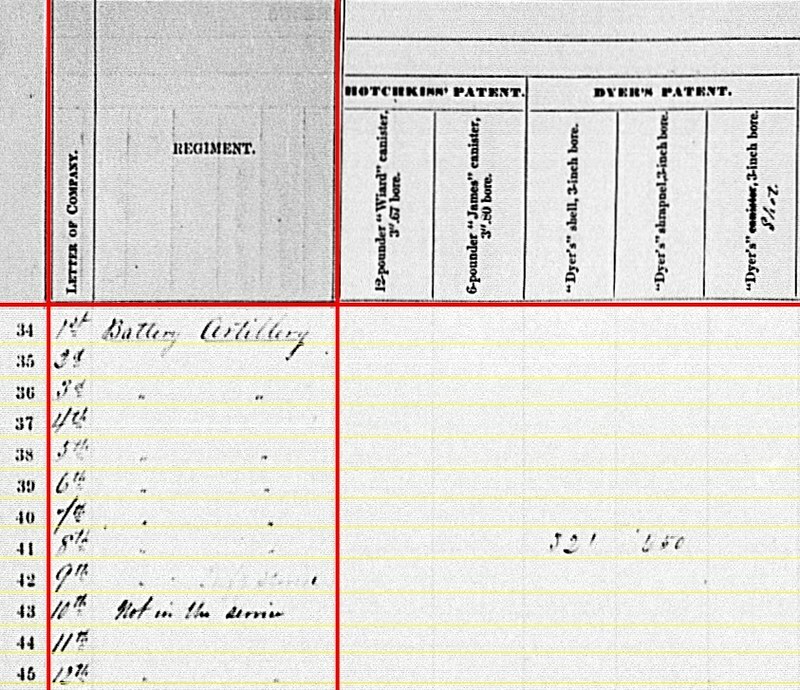 Thus five of eight batteries were on the field of Gettysburg by July 3. Notice all batteries were uniform in armament. Battery B: 252 shot, 84 shell, 252 case, and 84 canister for 12-pdr Napoleons. Battery E: 288 shot, 96 shell, 288 case, and 96 canister for 12-pdr Napoleons. Battery F: 400 shot, 160 shell, 360 case, and 144 canister for 12-pdr Napoleons. Battery D is noticeably absent from this page. Battery A: 195 canister, 54 percussion shell, 464 fuse shell, and 504 bullet shell for 3-inch rifles. Battery G: 179 canister, 4 percussion shell, 133 fuse shell, 344 bullet shell for 3-inch rifles. Battery H: 231 percussion shell and 589 bullet shell for 3-inch rifles. Battery G: 34 shell and 20 canister for 3-inch rifles. Battery H: 120 shrapnel for 3-inch rifles. Battery C: 324 shell, 204 case, and 122 canister for 10-pdr Parrotts. Battery C: 460 shot for 10-pdr Parrott. 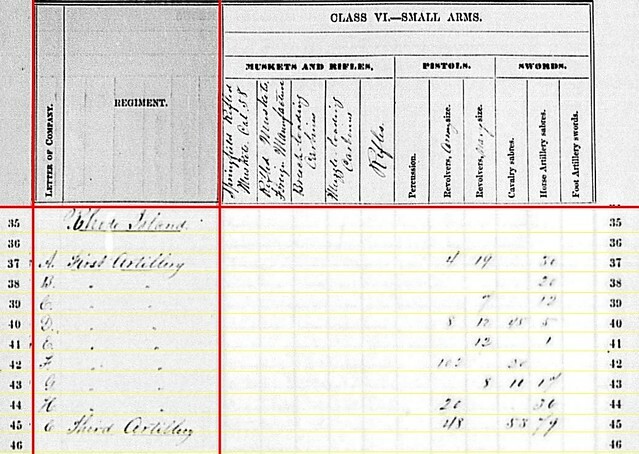 As most sources have Battery C on the field at Gettysburg with 3-inch Ordnance rifles, yet the returns give us Parrotts, the ammunition quantities may indicate an initial issue of ammunition. 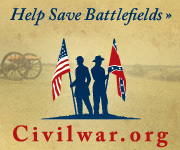 The turn-over of guns appears to have occurred as the Gettysburg Campaign was winding down. Still, that is a lot of shot for field gun duty. And I am pressed to explain why a battery would switch guns at that particular time. Battery A: 64 shell for 3-inch rifles. Battery G: 146 shell for 3-inch rifles. Battery H: 260 shell for 3-inch rifles. Battery A: Four Army revolvers, twenty Navy revolvers and thirty-nine horse artillery sabers. Battery B: Twenty-six horse artillery sabers. Battery C: Eight Navy revolvers and twelve horse artillery sabers. Battery D: Eight Army revolvers, twelve Navy revolvers, forty-five cavalry sabers and eighteen horse artillery sabers. Battery E: Fifteen Navy revolvers and four (?) horse artillery sabers. Battery F: 104 Navy revolvers, twenty cavalry sabers and nine horse artillery sabers. Battery G: Fourteen Navy revolvers, ten cavalry sabers, and eighteen horse artillery sabers. Battery H: Twenty Army revolvers and thirty-six horse artillery sabers. One note with the small arms. Battery F’s history alludes to service of detachments either as cavalry or as artillery assigned to support cavalry, on patrols in North Carolina. The small arms reported seems to back that up. Battery A: At Falmouth, Virginia with six 3-inch Ordnance Rifles. Captain William A. Arnold remained in commanded this battery, supporting Second Division, Second Corps. Battery B: No station given, but with six 12-pdr Napoleons. Battery was also assigned to Second Division, Second Corps and was thus also at Falmouth. When Captain John G. Hazard became the division’s artillery chief, Lieutenant T. Frederick Brown assumed command (the move occurred at the end of the winter months). Battery C: No station given, but with six 3-inch Ordnance Rifles. Captain Richard Waterman commanded this battery, assigned to First Division, Fifth Corps. The battery was also in the Falmouth area. Battery D: At Lexington, Kentucky with six 12-pdr Napoleons. Captain William W. Buckley commanded this battery assigned to Second Division, Ninth Corps. Recall this division was among the troops dispatched wet to Kentucky, with Burnside, during the winter months. Battery E: At Falmouth with six 12-pdr Napoleons. Captain Pardon S. Jastram’s battery remained with First Division, Third Corps. Battery F: At New Berne, North Carolina with six 10-pdr Parrotts (shed of two howitzers reported in the last quarter). Captain James Belger commanded this battery, part of the Artillery Brigade, Eighteenth Corps. Battery G: Falmouth, Virginia with six 3-inch Ordnance Rifles. Assigned to Third Division, Second Corps, then at Falmouth. Captain George W. Adams assumed command prior to the Chancellorsville Campaign. Battery H: At Union Mills, Virginia with six 3-inch Ordnance Rifles. Assigned to Casey’s Division, Twenty-second Corps from the Defenses of Washington. Captain Jeffrey Hazard commanded this battery. Company C: At Beaufort, South Carolina with four 12-pdr field howitzers, having turned in it’s mix of Parrotts and 24-pdr field howitzers. Captain Charles R. Brayton was in command, assigned to the Tenth Corps. Battery B: 288 shot, 96 shell, 388(?) case, and 96 canister for Napoleons. Battery E: 288 shot, 96 shell, 288 case, and 96 canister for Napoleons. 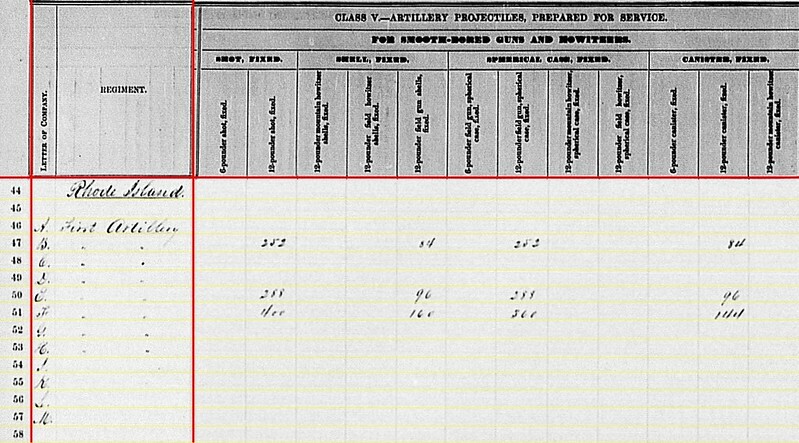 Battery C, 3rd Artillery: 426 shell, 549 case, and 164 canister for 12-pdr field howitzers. So no ammunition reported for Battery D. And two very suspiciously uniform lines for Battery B and E. Battery C, by the way, had plenty of ammunition on hand. Battery A: 195 canister, 57 percussion shell, 467 fuse shell, and 509 bullet shell. Battery C: 120 canister, 251 percussion shell, 193 fuse shell, and 603 bullet shell. Battery G: 239 canister, 104 percussion shell, 211 fuse shell, and 461 bullet shell. Battery H: 120 canister, 250 percussion shell, 280 fuse shell, and 582 bullet shell. Battery F: 1,293 shell, 171 case, and 134 canister for 10-pdr Parrotts. Yes, 1,293 shells…. 215 shells per gun in that battery. Battery A: 157 Schenkl shells for 3-inch rifles. Battery G: 181 Schenkl shells for 3-inch rifles. Other than a few open questions (particularly with Battery D, moving to the Ohio Valley, not reporting ammunition on hand) these are “clean”. So on to the small arms. Battery A: Four Army revolvers, twenty Navy revolvers, and thirty-nine horse artillery sabers. Battery B: Twenty-five horse artillery sabers. Battery D: Eight Army revolvers, twelve Navy revolvers, and eighteen horse artillery sabers. Battery E: Seventeen Navy revolvers. Battery F: Sixteen Army revolvers, eighty-eight Navy revolvers, twenty cavalry sabers, and nine horse artillery sabers. Battery G: Fourteen Army revolvers and eighteen horse artillery sabers. Battery H: Twenty Army revolvers and thirty-two horse artillery sabers. Battery C, 3rd Artillery: Forty-nine Navy revolvers and 120 cavalry sabers. There were two batteries included within these summaries which lacked any direct affiliation with the Army of the Potomac (Battery D was leaving that army, being transferred west). Those two batteries, Battery F and lone heavy battery serving as light, were posted to backwater assignments. Those two batteries reported a larger quantity of small arms on hand, as they assumed some non-artillery roles in the line of duty. Battery A: At Falmouth, Virginia with six 3-inch Ordnance Rifles. Captain William A. Arnold commanded this battery supporting Second Division, Second Corps. Battery B: No return. Battery was also assigned to Second Division, Second Corps. It was under the charge of Captain John G. Hazard. This storied battery had six 12-pdr Napoleons. Battery C: No return. Assigned to First Division, Fifth Corps, Captain Richard Waterman commanded this battery. They had six 3-inch Ordnance Rifles on hand during the battle of Fredericksburg. Battery D: At Newport News, Virginia with six 12-pdr Napoleons. The battery was actually at Falmouth at the end of 1862. Newport News is the location of the battery in March 1863, when the return was received in Washington. Captain William W. Buckley commanded this battery assigned to Second Division, Ninth Corps. Battery E: At Falmouth with six 12-pdr Napoleons. Captain Pardon S. Jastram’s battery supported First Division, Third Corps. Battery F: At New Berne, North Carolina with two 12-pdr field howitzers and four 10-pdr Parrotts. Captain James Belger commanded this battery, which was assigned to the newly-formed Eighteenth Corps at the time. Battery G: No return. Charles Owen’s battery was part of Third Division, Second Corps, then at Falmouth. 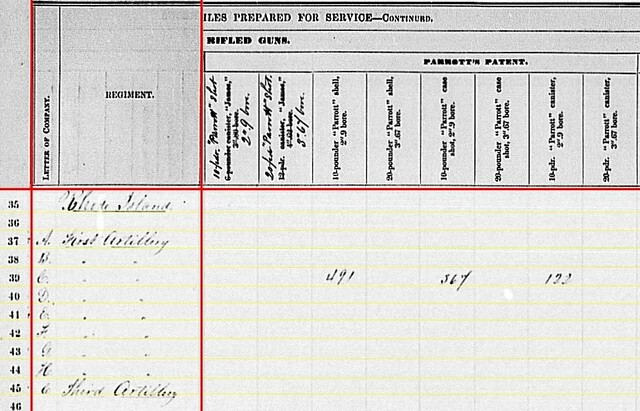 However, Lieutenant Crawford Allen is listed as the commander at the end of the year.The battery had six 3-inch Ordnance Rifles at Fredericksburg, firing 230 rounds. More on those later. Battery H: At Fairfax Station, Virginia with six 3-inch Ordnance Rifles. Assigned to Casey’s Division from the Defenses of Washington. Captain Jeffrey Hazard commanded this battery. The position of the regiment at this time were as follows: The head-quarters, with eight companies, within the entrenchments on Hilton Head, two of which were in Fort Welles; two companies – one heavy (A) and one light (C) – at Beaufort, A in Battery Stevens; one company (L) in the fort at Bay Point; one company (G) in Fort Pulaski. Company C: At Hilton Head, South Carolina with two 24-pdr field howitzers and two 10-pdr Parrotts. 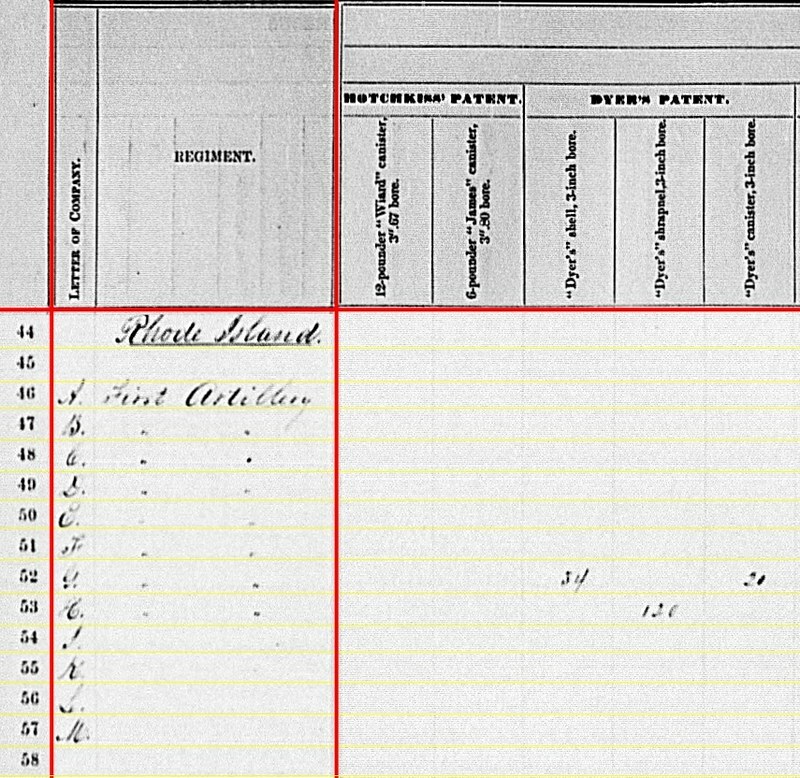 I think Captain Charles R. Brayton was in command of the company at this time. Moving forward to the ammunition columns, allow me to refer to that heavy company as “Company C”, to differentiate from the light batteries. There was no report from Battery C, so we have some room to avoid redundancy. Battery F: 120 shell, 151 case, and 18 canister for 12-pdr field howitzers. Company C: 175 shell, 90 case, and 80 canister for 24-pdr field howitzers. So we don’t have quantities for batteries B and D which we know had Napoleons on hand. Battery A: 110 percussion shell, 450 fuse shell, and 434 bullet shell for 3-inch rifles. Battery H: 720 shrapnel for 3-inch rifle. Battery F: 175 shell, 75 case, and 54 canister for 10-pdr Parrott. Company C: 240 shell, 189 case, and 60 canister for 10-pdr Parrott. Battery H: 360 shell and 120 canister for 3-inch rifles. During the five days, I expended about 230 rounds of ammunition. The Hotchkiss shell and case shot is the only variety upon which I can rely. The Dyer ammunition generally misses the groove, and the Hotchkiss percussion bursts in the piece. It may be proper to state that, from the experience of the last nine days, as well as from ten months’ active service with the 3-inch gun, I consider it inferior at ranges of from 900 to 1,500 yards to the 10-pdr Parrott gun. The Schenkl percussion and the Hotchkiss fuse shells worked to entire satisfaction. The ordnance ammunition with metallic packing failed in almost every instance to ignite the fuse, and I consider it worthless when explosion constitutes the chief value of the projectile. As solid shot, the ordnance shrapnel was serviceable in the cannonade of Fredericksburg. A couple of opinions to weigh on the scales. Battery A: Twenty-four Army revolvers and thirty-nine horse artillery sabers. Battery D: Twelve Navy revolvers and eighteen horse artillery sabers. Battery E: Fourteen Navy revolvers. Battery F: 104 Navy revolvers and nine horse artillery sabers. Battery H: Twenty Army revolvers and twenty horse artillery sabers. Company C: Fifty Navy revolvers, 120 cavalry sabers, and one horse artillery saber. The pattern seen here was for batteries operating in the side theaters to have more small arms. Given the service of both and detailed duties, that follows logically.